Peter Blackie | TV, eh? Canada is a brutal, wild place and the folks that inhabit it are pretty much that way too. That’s what we’ve learned after Sunday’s debut episode of Frontier. “A Kingdom Unto Itself,” written by co-creators and executive producers Peter and Rob Blackie and Perry Chafe, served not only to introduce viewers to the key players in Season 1 but to get the storylines going at a frenetic clip. There’s Michael Smyth (Landon Liboiron) an Irish lad who stowed away on a ship when he was caught stealing from it and woke up at sea, on the way to Canada. There’s Lord Benton (Alun Armstrong) the stern former military man who’s in charge of the Hudson’s Bay Company and aims to take out a man named Declan Harp. 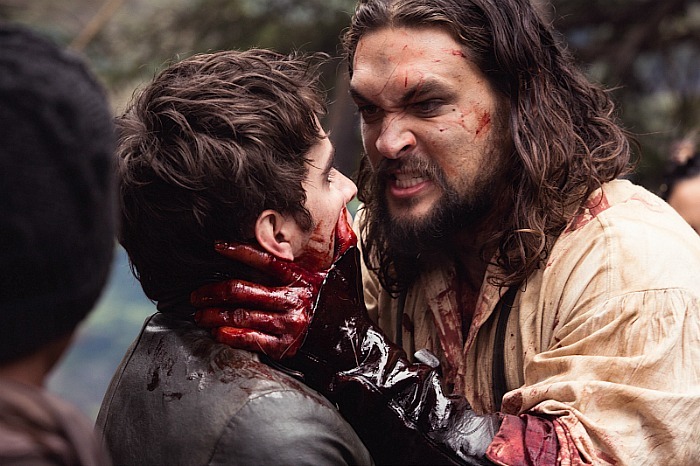 There is Harp (Jason Momoa) himself, a hulking man whose violent nature and Métis lineage makes him a successful fur trader. Add in supporting characters like Cobbs Pond (Greg Bryk), Samuel Grant (Shawn Doyle) and Grace Emberly (Zoe Boyle) and Frontier is jam-packed with action. By the end of Episode 1, Michael has been successful in locating Harp for Benton, but the young lad was on the verge of becoming another pelt in Harp’s collection. We spoke to the Blackie brothers about Frontier and where the show will go in Season 1. Peter, congratulations on Season 1 of Frontier and on Season 2 being ordered already. Was it always in the back of your minds to have Frontier last multiple seasons? Peter Blackie: For sure. That was always our hope. You always go into a scripted series wanting to do a number of seasons if you can. But the real telltale is if they don’t like the first the season you’re probably not going to get another. Rob Blackie: We’re actually in production on the second season right now, so this is a huge sign of confidence from Discovery Canada and Netflix. Frontier is incredible visually, character and story-wise and wardrobe-wise. You’ve successfully introduced all of these characters and yet it doesn’t feel bloated or cluttered. It must have been difficult to have so much contained in six episodes and not feel bogged down. RB: Pilots are interesting because they are burdened down with all of these required introductions. We spent the vast majority of our time working with our writing team and producing partners and director for the pilot, Brad Peyton, and making sure the ‘introductory elements’ have their own story engine so that when you watch them as a viewer they feel like a forward-moving story. It’s much more difficult to do it that way but we had a lot of people working hard on it for a very long time. PB: Another thing that helped make it work, in particular for the pilot, was having actors in the show of a Shawn Doyle calibre who are able to really elevate everything because of their abilities. There are several storylines going on in the first episode, but it feels very much like we’re seeing this world through Michael’s eyes and that he is our guide. Is that true? PB: We refer to him as our protagonist. The show is set up to do multiple perspectives and kingdoms, but he functionally is the way into the show. RB: And Declan Harp is our antihero. He’s the major star of the show and is introduced in the pilot in a very dark way. We are experiencing Declan Harp’s dark view of the world from Michael’s perspective. Jason Momoa is listed as an executive producer. What did that title entail? Was he involved in day-to-day decisions? RB: He didn’t have any day-to-day line producing or anything like that, but someone like him plays such an integral function in the profile and promoting of the show. He’s very, very interested in the arc of the show and the arc of his character and participates heavily in that part of the process. It’s a common practice for a someone like him who shows a tremendous amount of interest. He’s a filmmaker at heart and has directed his own material and has his own production company. We produced a small feature film with his production company last winter in addition to doing Frontier and he is an absolute film artist at heart and that makes his a really good fit for our team. Why did you decide to start Frontier with the Hudson’s Bay Company crumbling rather than show how it began? PB: That’s a great question. Rob and I spent a lot of time at the very beginning wrestling through where we wanted to be, specifically, and why. The reason we picked the general era that we picked it is about a century after the monopoly was granted to the Hudson’s Bay Company and their dominion started to falter. The only company in history that ever properly did rival the HBC in the New World was the North West Company and it, essentially, was an amalgamation of a bunch of separate companies with smaller interests, predominantly run out of Montreal. They ultimately realized they were not able to complete as separate entities and were forced to combine their energies and formed a company that was, scale-wise, able to compete with the HBC. We picked this era because it’s sort of the David and Goliath scenario. Are any of Frontier’s characters named after any real-life people from history, or are they all a mix of real folks made into fictional ones? PB: Everybody who is in the show is, at most, amalgamations of different characters from different times or characters we completely created from scratch. RB: Earlier in the process we had taken a run at including ‘real characters’ from history and we found that, with the amount of historical fiction, it started to feel more limiting, and putting words into the actual mouths of people from history didn’t feel right to us. So we went with fictional characters and drew from as much research as we could from history and real people from history. The real people from history have the craziest stories. Can you talk a little bit about the research you did into the canoes, wardrobe and discussions you had with First Nations people to get this right? PB: We did, and we relied quite extensively on help from experts and people from within the communities. It’s been an interesting learning process for us. The deeper we went the more we realized how easy it is to make basic mistakes and we learned just how complex the socio-political landscape this country was like pre-contact. Once you introduce the idea of Europeans coming in, the complexity rolls over onto itself. We found ourselves in a spot where we didn’t have the tools to do the basic things and we reached out in a bunch of different directions to get help, including and not limited to wardrobe, language and representation. We had very patient, thoughtful, smart people who have committed to us not making mistakes and inspiring us to dive in and tell these stories. Frontier airs Sundays at 9 p.m. ET/6 p.m. PT on Discovery Canada. He says that a couple of times during the course of our chat about Discovery Canada’s first foray into scripted television. Yes, he’s set to co-star in the six-parter about the fight for wealth and power in the North American fur trade of the late 18th century, but he’s not the lead. That honour goes to Jason Momoa. 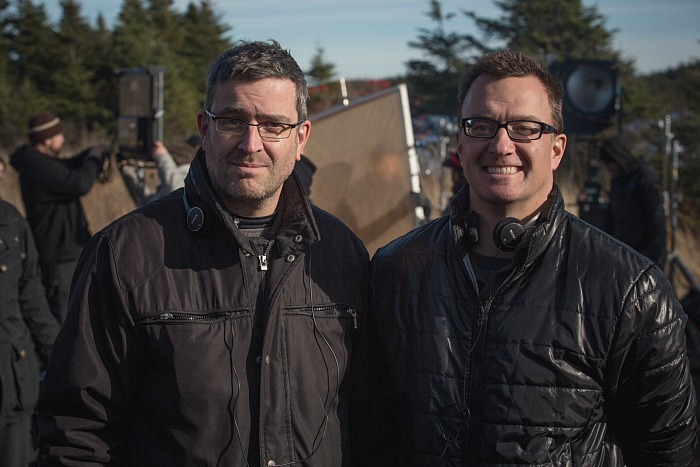 Instead, Hawco will remain largely behind the scenes, serving as an executive producer alongside his fellow Take the Shot Production partners, two of whom—Rob (on the right in the above picture) and Peter Blackie—actually conceived of the project. “There are so many stories to mine from history around the world, especially here in Canada, that has never fully been exploited,” Hawco says. “That’s just bizarre to me. I think there is a real appetite from Canadians to hear their stories told in an interesting and thought-provoking way.” Hawco, who starred, directed, wrote and produced Republic of Doyle for six seasons describes Frontier as being the story of the birth of capitalism in North America, and the greed, blood and power that went along with it. Frontier begins with The Hudson Bay Company, which has a monopoly on what’s happening during the fur trade in the region that will one day be Canada. Smaller factions seek out their own piece of the pie; Hawco portrays Douglas Brown, who plots alongside his brothers to steal some of the HBC’s thunder. Rob Blackie explains the idea for Frontier came about thanks to a chance meeting at MIPCOM between business parter Alex Patrick and Discovery’s Edwina Follows. The network’s interest in having more dramatic, scripted programming lead to the brothers kicking around ideas for a time period history-based series; they presented Follows with two projects and Frontier was greenlit. ‘It’s an interesting, super-violent part of Canadian history that not a lot of people know about,” Blackie says. “As soon as we started researching it, we were shocked at how little we knew and how conflictual the time period was. The deeper we got, the more interesting it got.” Momoa plays the series’ anti-hero, a part-Irish, part-Cree man named Declan who works with a gang and becomes an unlikely host to a boy named Michael who has been living on the streets of London. Other cast includes Alun Armstrong, Landon Liboiron, Zoe Boyle and Jessica Matten. Production just wrapped filming in England and has set up shop in St. John’s until a Christmas hiatus. Then it’s on to Louisbourg, N.S., to film at the famous fort and Morrisburg, Ont., to capture action at Fort Wellington in February. Frontier debuts on Discovery Canada and Netflix outside of Canada in 2016.